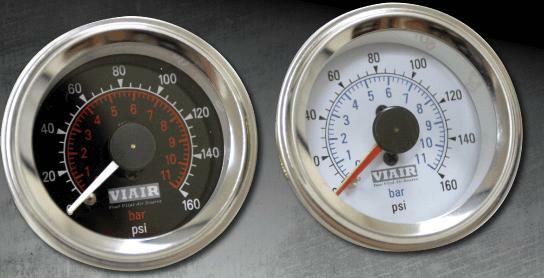 2 inch diameter Viair dual needle 160 psi air-gauge (illuminated) with chrome bezel and highly accurate pressure readings. These Dual needle air-gauges are what you need for keeping an eye on any two air pressures...and do it in style! For example, you can easily monitor the air pressure in two separate air bags, like both front, side or rear air bags. Each of the two needles work independently of each other and are hooked up by simply running air line to the two ports on the back of the gauge! Each features rear hook up and large numbers for easy reading. Made buy one of the most well known, and trusted, air suspension component manufacturers, Viair. Each is tested for accuracy before shipment. The large numbers, and many other features, make this style of gauge one of the most popular air-gauges in the air suspension industry. Simple to install! Other sites charge $45.99 for this exact air-gauge! You Save 13% by shopping with us!